﻿ Real Madrid 3-2 Valencia. A sprint to the finish line! 08.05.2016 » Real Madrid 3-2 Valencia. A sprint to the finish line! 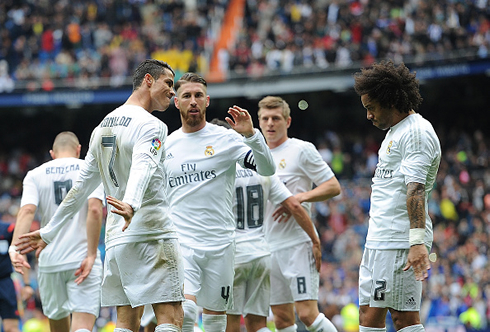 Real Madrid went through another obstacle this Sunday, hosting and beating Valencia 3-2 at the Santiago Bernabéu. La Liga will only be decided in the final round of fixtures this season and it's going to be a sprint to the finish line from both Barcelona and Real Madrid. Another win for Real Madrid and Zinedine Zidane in La Liga, who beat Valencia 3-2 this afternoon and reached their 11 straight victory in the league. Cristiano Ronaldo with a double and Benzema with his 24th goal of the season, helped lifting Madrid to a tough win against Los Che. With these 3 points, Real Madrid will at least keep their chase to Barcelona until the Spanish League final day and now it will all come down to the last weekend of the season. One point separates the two rivals ahead of next Sunday's thrilling fixtures, with Barça visiting Granada and Real Madrid paying a visit to Deportivo. The Championship picture is a little clearer, however, there is still no indication that Barcelona will drop the necessary points. Real Madrid squeezed by with a 3-2 victory over Valencia. Atletico Madrid are effectively out of the race, after their 2-1 loss to the already-relegated Levante. But Barcelona's 5-0 victory over Espanyol means that it will all go down to the last game. With the likes of Modric and Bale out for Madrid, there was a chance this could have been a far harder match than it was and truthfull, at times it seemed to be. Goals from Cristiano Ronaldo and a slightly-controversial one from Benzema, put Madrid up 2-0, but in the second half, some sloppy play allowed Valencia back into the game. Rodrigo Moreno scored after a poor clearance from Varane to make it 2-1 and after Cristiano Ronaldo scored again to put Madrid up by two, Valencia still wouldn't go away. André Gomes made it 3-2 late, setting up a nervy final minutes for the Merengues. But Los Blancos would find a way to stay in front, setting up a massive final day of La Liga next week. Barcelona will head to Granada, while Madrid will head to Deportivo. This basically means that La Liga will be decided away from home this season. Tonight's match also represented the last time Alvaro Arbeloa would appear in front of the home fans and the club legend was given a fantastic sendoff by the fans. 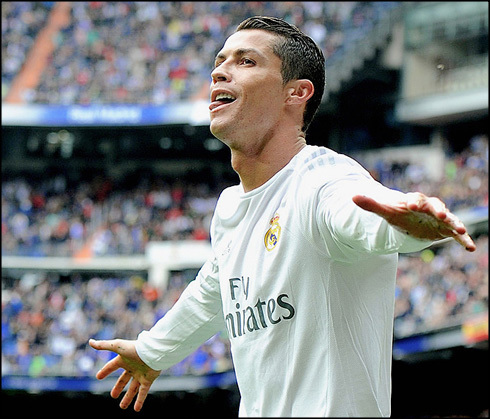 Cristiano Ronaldo next game with Real Madrid is for La Liga on May 15 of 2016, against Deportivo de la Coruña. You can watch Juventus live stream, Deportivo vs Real Madrid, Granada vs Barcelona, West Ham vs Manchester United, Liverpool vs Chelsea, and Norwich City vs Watford, all matches provided from our live football game pages.